A maintenance coat of Hardwood Finish should be applied within 3-6 months after the initial application or as soon as oil looks depleted. The next maintenance coat should be done again in approximately 10-12 months or whenever oil looks depleted. Over time, the wood fibers become fully protected and the maintenance will become less frequent. Wash the wood with a mild cleanser and warm water. Rinse well. Allow wood to dry for a minimum of 48 hours before application. Apply maintenance coat of Hardwood Finish. After 20-30 minutes of absorption time, wipe the surface with a nap-free, clean, dry cloth. Your Ipe or Brazilian Hardwood Deck adds value to your deck. These woods are very dense and durable and will last a lifetime. However, to maintain their rich color you will have to periodically apply a UV Inhibitor finisher. Ipe Oil or Messmer’s Hardwood UV Plus will keep our deck looking its best. Clean all the dirt and leaves off of the deck. If you are re-oiling, you should consider a deck cleaner such as Messmer’s Wood and Deck Cleaner (Part A below), or other high quality of deck cleaner. After cleaning, make sure your deck is dry. You may need to wait a few days to insure your deck is thoroughly dry. Make sure your finisher is mixed thoroughly. Clear or Natural finishers still have a pigment. If they were completely clear they would not be able to reflect the Ultra-Violet (UV) that causes your deck to turn gray. 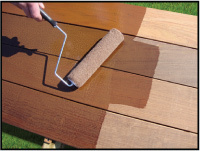 Brush or Roll the finisher on your deck. Here is a photo how to of a local contractor who used unique application method to increase speed. 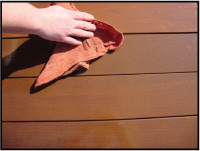 If you use a roller, be sure to go back and remove pudding, splotching, and get between the deck boards. Get rid of roller covers and such safely. Hardwood Finish Colors Available in a natural, transparent tone. 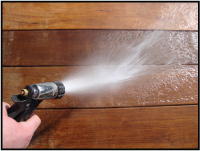 Brush on, use a stain pad, or spray on (garden or pump airless sprayers) one coat of Penofin. For maximum penetration, wait 20-30 minutes, then use a nap-free shop cloth and wipe the entire surface, removing any excess product. The application is now complete. Messmer’s Wood & Deck Cleaner (Part A) for all woods. Clean up to 500 square feet with one 16 oz jar. 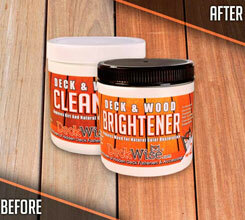 Use Wood and Deck Cleaner (Part A) on all woods including cedar, redwood, ipe, pine, and pressure treated lumber. It is important to clean before applying wood finishes. If you apply Ipe Oil or Messmers UV Plus or any wood finishes to a dirty wood surface, the wood will go dark and dingy. The oils and resins in the stain entrap the dirt and make it impossible to clean until the product wears away with the top surface of the wood. By cleaning the wood with a good quality wood cleaner like Messmer’s Wood and Deck Part A, you are properly preparing the deck or other wood surface for staining with UV Plus. For woods prone to tannin staining such as redwood and some cedars, use Wood and Deck Brightener (Part B) to lighten wood and remove stains. The Part B also works great on iron and rust stains on all woods. This product is what you will find on the ends of all your deck boards. Whenever you cut a board to fit your deck you need to re-apply. If not, you will get cracking down the end of the board. This cracking, also called checking, happens in a few weeks and can extend an inch or more. One quart can will do approximately 500 square feet. Our contractors tell us in the real world a quart will do about 130 deck boards. Ipe Seal™ End Grain Sealer is similar to Anchorseal.